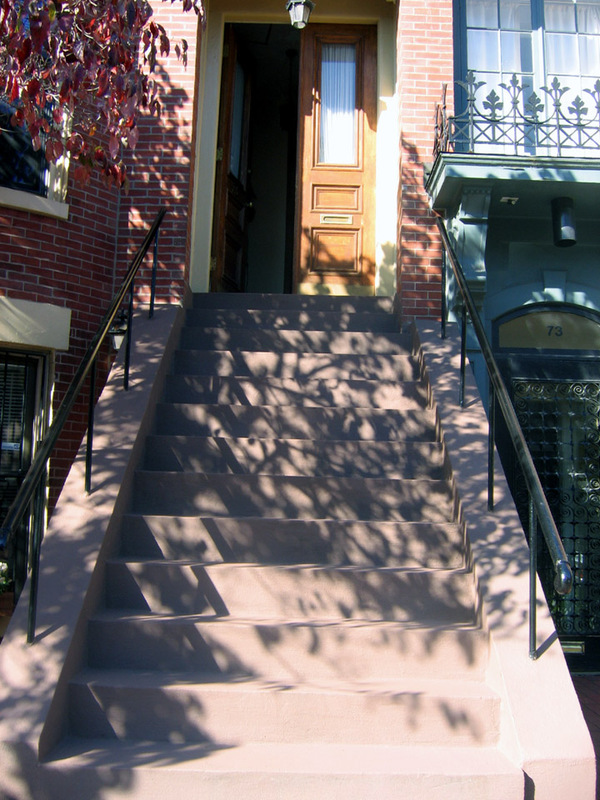 Twenty years later, in 2005, we were able to move into our little pied á terre. Rosemary walked to work at the Prudential. I cleaned and cooked and shopped. May I say that being a kept man was a long time dream come true. I highly recommend it. But still, we were bumping into each other in the little hall. So began the travails of building a little outdoor retreat in an historic district of an historic city. My first efforts of asking around the neighborhood were squelched by all who opined: You’ll never get a permit…; you need an engineer, if you can find one who will take a little job, and they cost a fortune…; the neighbors will object…; you can’t put poles in my yard… (spoken by the owner of the garden unit in our building); these old brick walls won’t support it… (if one can’t have poles in the yard, then a cantilever design is required). Thus unencouraged and forewarned of the obstacles, I back burnered the idea. But a couple of years later I found a flyer on a neighbor’s door step advertising a company, one man, actually: John Carter, who built fire escapes and iron decks in the South End. What could hurt? I called, he showed up, took a look and named a price: $5,000 for a nice little deck off my bedroom. “You’ll have to get a carpenter to turn that window into a door,” Mr. Carter said, “Probably cost you another two grand.” Really? I thought, I can have a deck for less than ten thousand dollars? “How long do you think this will take?” I asked. Now, mightily encouraged by Mr. Carter’s show of competence and confidence, I gave him a check for $2,500 and told him to begin at once. 1. Find a contractor. As I said, John Carter came by way of a soggy flyer on a doorstep. Much later we found we needed two: the iron guy, John Carter, and the everything else guy, a Mr. Warren Gilman of City State Construction. Mr. Carter brought Mr. Gilman in when he found the job was bigger than anticipated. No surprise there. I got estimates. But even I know that estimates are, well, only estimates. Depending on who you get contractor-wise (some do more than others), the home owner may have to do much leg work. And I did; occasionally having my hand held by local contractor and friend Bill Thibodeau. The City of Boston’s Inspectional Services Department is kinder and gentler to the homeowner than to the contractor, thus my personal involvement in the machinations of the permitting and appeals process. 2. Get engineering drawings. Wait. John Carter recommended the architect/engineer who did the design engineering and drawings. And, as mentioned, he also brought in Mr. Gilman. These two men were worth all the delays and foot dragging and excuses Mr. Carter put me through for nearly two years. He’s a nice man, but I feared his talk was far better than his walk. Nearly a year went by after I gave Mr. Carter that $2,500 deposit. Whenever John hit a problem, such as when he went to Boston’s Inspectional Services at 1010 Mass Ave to get a permit and they told him my address was wrong and my condo was a house, not a condo, he stopped working for me. He didn’t tell me about this. He just stopped doing anything. In the process he changed his phone number. I found this out by calling for an update and getting the number you have reached is no longer in service message. Oh, No! I have been snookered! But, no, he had just gotten busy with other, easier, things. It took me a while to find John’s new number via the engineer with whom he had an ongoing business relationship. I called him prepared for a fight. But he was nonplussed, and said he couldn’t proceed because of the not-a-condo issue. It’s a typical contractor mindset that obstacles to progress are your problem, not theirs, even if they have your money. Communication is not their strong suit. I went to 1010 Mass. Ave to find out why my condo was not a condo. A nice permit intake person clacked away on her keyboard for a while and found out what the SNAFU had been. She said that someone in her office had not done their job properly when John Carter had first shown up. I blessed her for the help. Progress! 3. Obtain Landmark Commission approval. Wait. My condo is in an historic district of Boston, the South End: formerly a collection of brick row rooming houses for the working class. 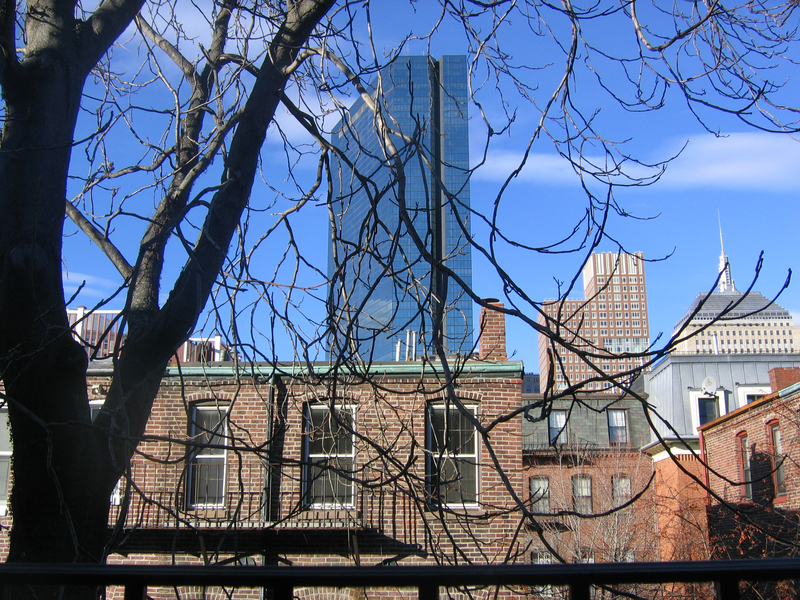 It has evolved into one of Boston’s most desirable neighborhoods to live and work. Before applying for a permit, a special approval is required for all work on these buildings from the Boston Landmarks Commission. 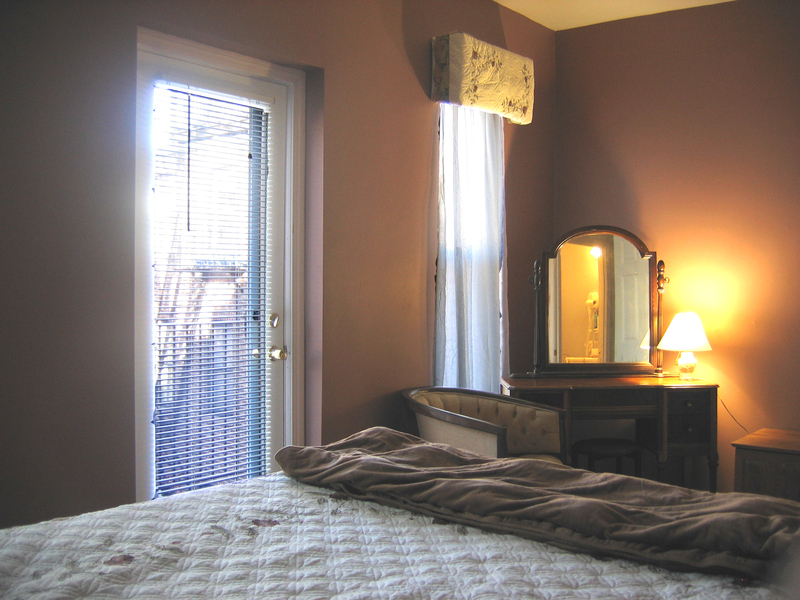 However if your plans show that your modifications are not visible from the street, then approval is quick and easy. And that was the last thing that was easy. 4. With Landmark approval in hand, I submit construction drawings, along with pictures of the back of house, application, and permit fee. Wait. 5. My request for a permit is denied. After a few weeks I got a notice in the mail with the “Denied” box checked off in a form letter. 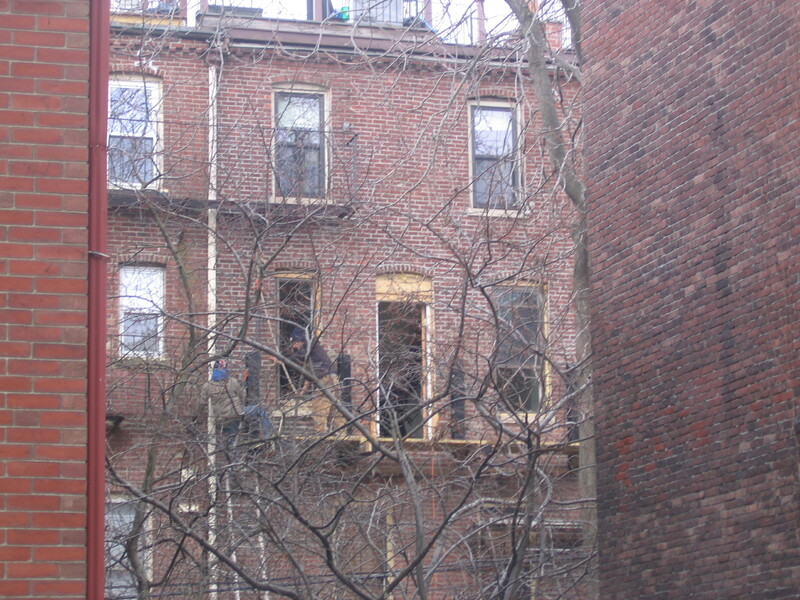 South End zoning does not allow a deck above the first floor. Who knew? You would think that someone somewhere along the way would have told me that. 6. Go back to 1010 Mass Ave and file an appeal. Pay another fee. Wait. Eventually, the appeals board sent a form letter asking me to provide a rationale as to why they should grant a variance. They even gave suggestions as to what constitutes valid reasons for said variance: Quality of life issues: Outside space required even for those unfortunate enough to live above the first floor, many other people have decks, etc. 7. Prepare for the appeal. b. The picture of the back of the house. c. Pictures of other decks on buildings adjacent. d. A form letter that says they support (or at least do not object) to me building a deck. e. I wrote a personal letter, after finding all my neighbor’s names, appealing for their support. I spoke personally with everyone I could, asking if they would attend to this letter and send me a copy. I included two stamped and addressed envelopes in the package: one for City Hall, and one to send a copy to me so I could bring a big pile of support papers to City Hall. Mr. Carter, bless his helpful heart, said the bigger pile of paper you can supply in support of your appeal, the better. City Hall likes piles of paper. I distributed twenty-five of these packages in my neighborhood. I got three or four back. Even the people who told me face to face that they would support the building of a deck did not bother to reply. I guess we’re all busy… but, geez! However, I got enough to work with. Most importantly, nobody voiced an objection. 8. Mail the appeal form, rationale, copies of support letters, pictures, and drawings to the appeals board at City Hall. Wait. 9. After a few weeks, I got a notice in the mail telling the time and date to show up at City Hall for the appeal hearing. Wait. It is quite a scene. I, and dozens of others, wait our turn as a group of engineers, building inspectors, and political appointees sit on a raised dais before the assembled supplicants. There’s yelling, tears, and gavel pounding as those who object to whatever is being appealed shout out their concerns, as well as moans from those who have been denied. Some of the people have lawyers, engineers and contractors with them. I went by myself. I am called up in my turn and sit, humbly, before this group that holds the fate of my little deck in their collective mitts. As I take my seat, two people I have never seen before stand up from somewhere in the crowd and declare that they have no objection to my appeal and wish the board to support it. I found out later that these folks are from the mayor’s office and the city council office from my district. Part of the appeal includes a requirement that elected officials approve the appeal. So they send these people to expedite that process. All very political. And one of the few times expedition was in evidence. I think it helps if you are a regular voter. The engineers looked over my drawings and asked a couple of easy questions. One engineer complimented me on the drawings saying this is how these decks should be done. Well, OK! They approved me, and said good luck with my deck. It took three minutes. 10. Finally! A permit. Construction can begin. Ahh, no… sorry, not just yet. Wait. 11. Go back to 1010 Mass Ave with my approval from the appeals board and apply, again, for a permit… and pay a fee. Wait. 12. The appeals board (or Inspectional Services, I can’t quite recall) now sends a letter to all my neighbors. Wait. The letter says I have applied for a permit to build a deck and does anyone have an objection. If so, send your objection to… etc. What? Did they not look at all that stuff I sent many weeks earlier? You would think this would have happened during the appeals process. But, no. As before, no one objected. 13. Inspectional Services sends me another letter. This letter states that before I can get a permit, an engineer at City Hall must review my plans and approve them. Really? I thought that’s what Inspectional Services did. But I guess not. 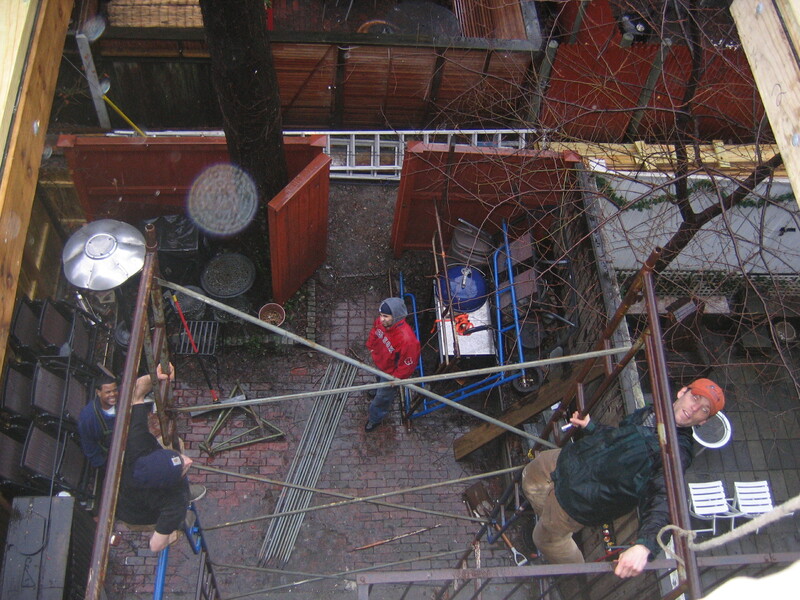 My construction manager, Mr. Gilman, tells me that it might go smoother if I go myself to City Hall. So, I called City Hall to find the right department and schedule a review. 14. Go to City Hall and find the Engineering Department. At the appointed hour I wind through the concrete labyrinth that is Boston’s City Hall. Here I meet with a most attractive young woman who is one of the City’s engineers. As she reviews my plans I kvetch about the cumbersome process the City puts us through. She agreed, and even sympathized, saying they are trying to streamline the process. Then she tells me that my plans contain a fuzzy design issue. Inspectional Services might have a problem with it, and delay permitting even further. I slump in my chair and struggle to avoid whimpering right in front of her. She takes pity on me, pitiable as I am right now, and writes notes on the plans explaining exactly how the construction was to be done and said that if there was a problem that she would intervene and move things along. I blessed her, too! I walked them directly from City Hall to Warren Gilman’s office around the corner, anything to avoid more delay. He takes everything to 1010 Mass Ave. to apply for the final Permit, now seeming like the Holy Grail of Decks. I could have done that myself as well. But by this time I was letting Warren do some of this as he was much more pro-active than Mr. Carter. In his hand! It’s a yellow card that I must place in a visible spot in my window. My yellow card further has the extra gray stripe on it that says Landmarks has also approved of the work. A highly coveted piece of cardboard, this. “Well, yes… but not just yet,” says Warren. By now I am inured to “not yet.” I resignedly ask Warren when, if ever, will my deck come to be. He explains the tricky coordination of various trades: electrical, plumbing, carpenters of various skills, painters, window and door people. This one can’t do their job till that one does his. And of course you can’t finish up until the inspector comes in at a semi-complete stage to approve the work. There was the usual finger pointing as to who is responsible for delays. From the first hammer applied to plaster and brick, to the last swipe of a paint brush, it took five months. Which was swift in comparison to the lengthy approval process. Plaster dust and ordinary dust inundated our condo (and the condo below) for three or four of those months, even though a barrier was built between our bedroom and the living room, complete with zippered plastic door. 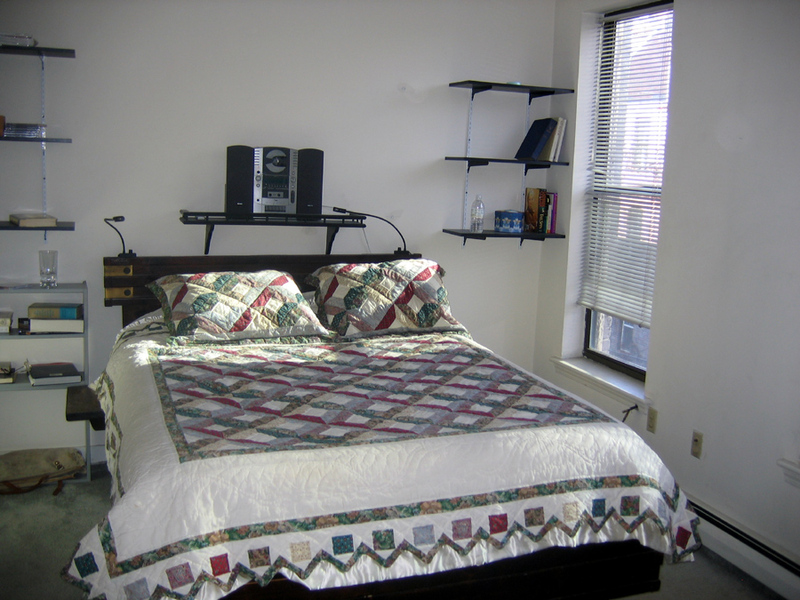 Rosemary and I slept on the pull-out couch for months while construction was in process. I gave John Carter $2,500 in April of 2008. 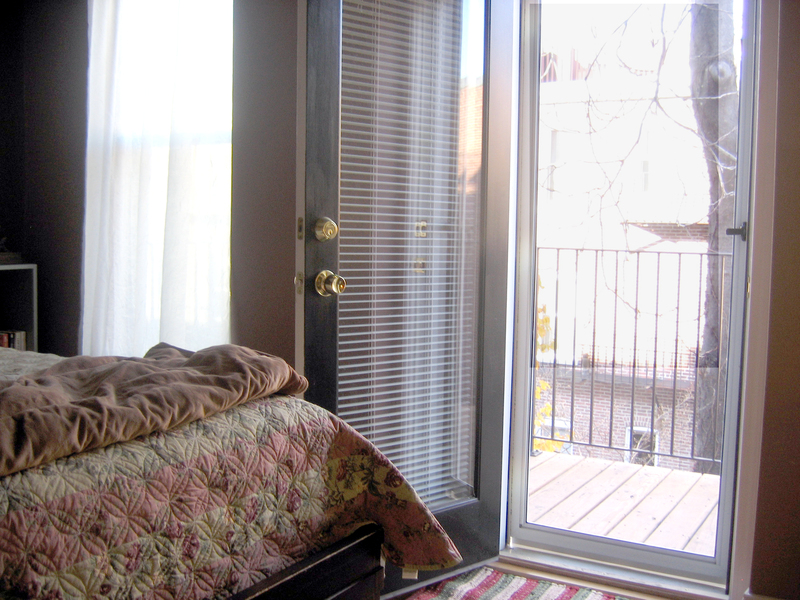 Warren Gilman fixed the last punch list item (a little hole in a brand new window screen) in December of 2010. Nearly three years. And like all big projects, if I had known in advance what it would take, I probably would have passed. But blissful ignorance has its benefits. I have my little Eden in the Air. The final irony: we didn’t get to sit on our new deck. We moved out the night it was finished as we had to rent the place for several months to pay for everything. This note is to ask for your support with the Boston Board of Zoning Appeals as Rosemary and I try to get approval for a zoning variance to build a balcony at the back of our unit. You may have received a notice from the Board about our upcoming appeal hearing on May 26, 2009 at 9:30AM. Attached is a copy of that notice. 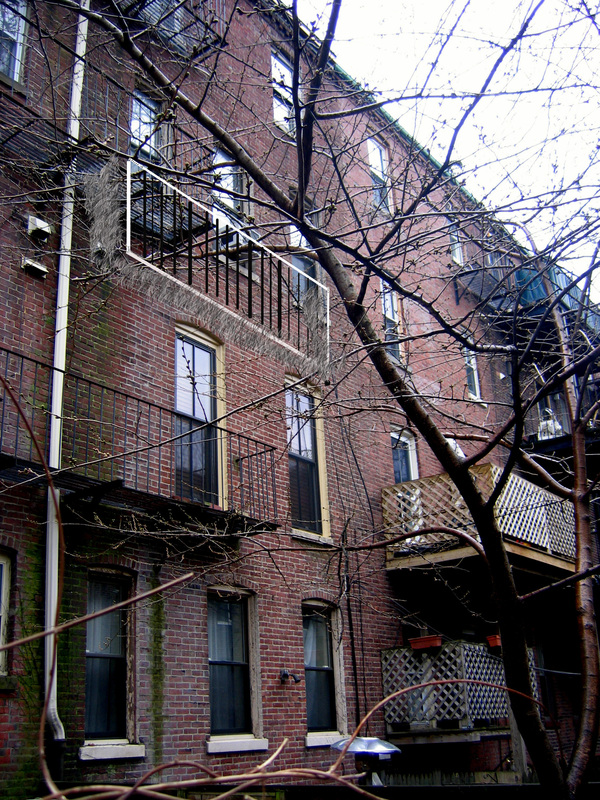 As you may know, in the South End, balconies of any kind above the first floor are permitted only by a zoning variance from the Board of Appeals. Attached for your info, is a copy of the engineering plans for our balcony and a couple of pictures of the back of our building, as well as a similar balcony down the alley. Ours will be the only balcony at the back of 75 Appleton. Although other unit owners at 75 Appleton may wish to build similar balconies in the future. Our contractor is John Carter of Carter Iron. He has done work throughout the South End and comes highly recommended. 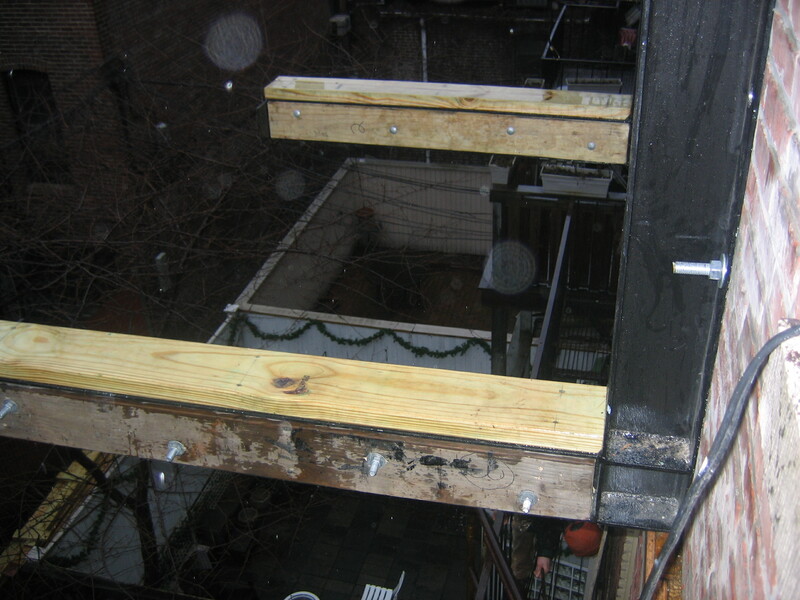 The proposed balcony is small, 5×12 feet, and supported by robust tie-in to the internal building structure, rather than posts in the yard below. It will be of black iron and, structurally and design-wise, in harmony with other balconies throughout the South End. John Carter tells us that support from our neighbors is an important element in gaining approval. If you could send us a note on your letterhead affirming you have no objection to our balcony, that would be most helpful and much appreciated. Enclosed is a stamped envelope addressed to us at 75 Appleton. Or, if you prefer, just jot a note on the form in the Appeals notice (enclosed) and send it to: Board of Appeal, 1010 Massachusetts Ave, 4th Fl., Boston, MA02118. An envelope for that option is also enclosed. Thanks in advance for your consideration. And please call if you have questions or concerns. Rosemary and I are staying at our house in the woods for the summer, but we’ll be back in the fall, hopefully to sit on our new balcony. Job Description: Install rear balcony, windows and door. 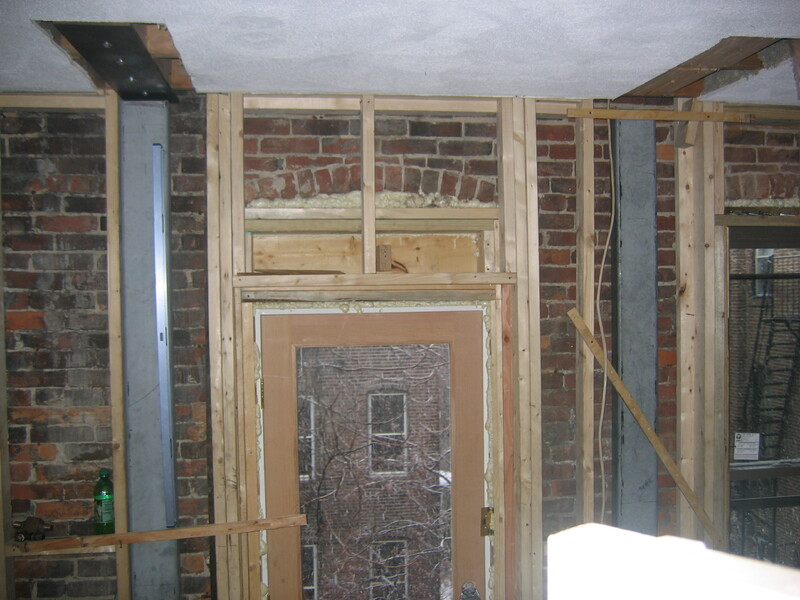 Permits Obtain necessary building permit and inspections needed for the project. Preparation/Protection Seal off bedroom. Protect hallway and common stairs. Clean during project and upon completion. 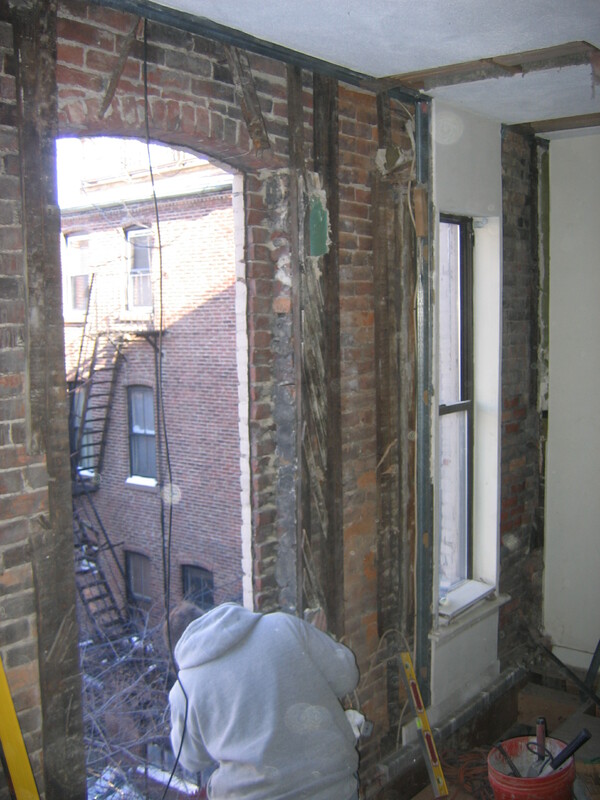 Demo Remove four sections of wall, ceilings, floor and sub-floor. Remove carpet. 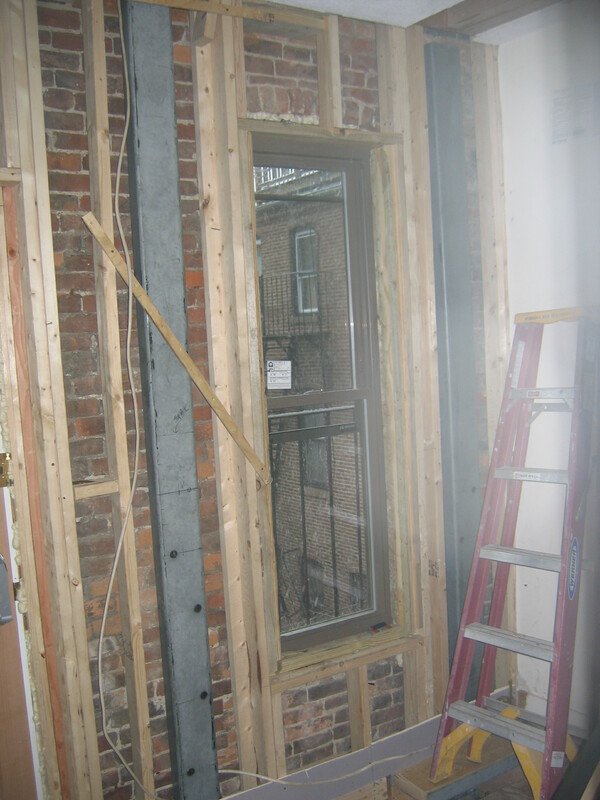 Cut brick wall and sill under middle window to allow for door installation. Patch masonry. Remove three windows and trim. Dispose of all debris. Framing Install new solid blocking required by plans. Fur out walls as needed to allow for new sheetrock. Install new sub-floor. Insulate where needed. Sheetrock and Plaster Patch walls and ceilings and skim coat. Texture ceiling to match existing. Plumbing- Cut existing baseboard heat and drop the loop below the new doorway. Install new end covers. This will require draining the system and re-filling it and possibly bleeding the system. Exterior Balcony Build exterior balcony according to plans provided.